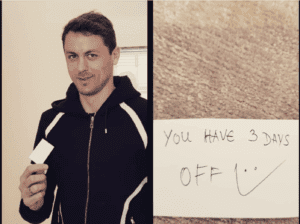 The Portuguese manager sent a piece of paper to Nemanja Matic during Sunday’s game versus his former club. The paper was given to Matic through Eric bailly who came on for Alexis Sanchez. The content of the paper was hidden and many football journalists dug deep to find out what it was. But all to no answer, today matic himself posted a picture of what was there. And this will make you laugh.